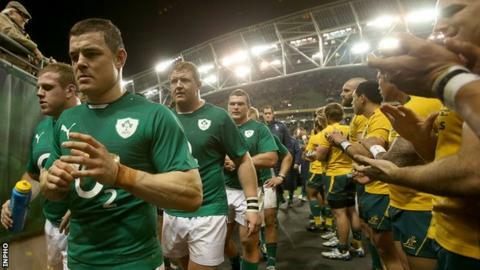 Coach Joe Schmidt admitted Ireland contributed to their own downfall in Saturday's 32-15 defeat by Australia. The Wallabies scored four unanswered tries to leave the Irish on the wrong end of a comprehensive scoreline. "Australia made it difficult for us and I felt we did not defend well enough to put them under pressure," said Schmidt. "We made some rudimentary errors in our defence, there were a couple of missed tackles and obviously the result is massively disappointing." This was Schmidt's second match since taking over from Declan Kidney, after a comfortable 40-9 victory over Samoa in their first autumn international. The New Zealander said his side were not taken surprise by the strength of the visitors, but felt the half-time loss of Jonny Sexton to injury was a significant setback as the fly-half was "pretty important" to them. The 28-year-old must wait for scan results on Monday to discover the extent of his hamstring problem. Schmidt said: "It is too early to tell. He felt it wasn't particularly bad and he pulled up quickly. "But it's out of our control, we just have to wait and see what happens and wait for the results of the scans. "We had given Jonny a weekend off and a refresher and we thought we would get two big weeks out of him, so it is really disappointing." Schmidt has plenty to think about ahead of the meeting with his native New Zealand, who will have gone through 2013 unbeaten if they win, in Dublin on 24 November. He said: "We lost a bit of our shape and when that happens it is tough against a very good team. "We have to find positives, it you don't you go backwards. I know people do not think there are too many, but we have to find them and forge ahead. "There are certainly some negatives, which we will have to tidy up."